A path descends from Highway 1 to the beach at Jade Cove, where bits of jade can be found. The entire Big Sur coastline, including Jade Cove, is within the Monterey Bay National Marine Sanctuary. There are specific regulations governing the collection of jade here. Please respect the integrity of this natural resource. Ocean currents are dangerous here, so swimming is not recommended. This location is under the jurisdiction of the Monterey Ranger District, Los Padres National Forest, U. S. Forest Service. 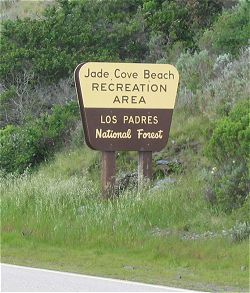 Jade Cove day use area is located within Los Padres National Forest and is managed by Parks Management Company. Has this Web site, A Guide to California's Big Sur, been worth something to you as you plan a trip to Big Sur -- maybe fifty cents? a dollar? If so, you can, if you wish, contribute that amount to help defray this site's costs. Learn how. 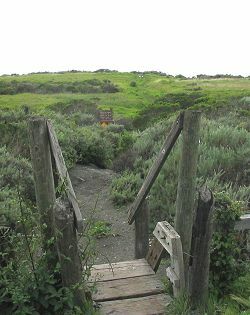 Green arrow marks this location in the Big Sur region.